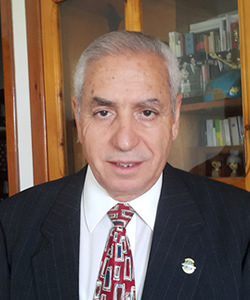 Background: As part of the International Higher Education Interfaith Leadership Forum, in July 2016 Melody Fox Ahmed conducted an interview with Mohamed Chtatou, who is a professor at Mohammed V University in Rabat, Morocco. Chtatou reflected on his experience with interfaith harmony growing up in the city of Sefrou, work with the Islamic Educational, Scientific and Cultural Organization, and desire to build a world characterized by love and forgiveness rather than extremism and violence. Please tell us something about your current work/role, and in what capacity it influences/incorporates interfaith efforts? I currently teach American students studying abroad in Morocco courses such as Aspects of Moroccan Culture, Contemporary History of North Africa, Moroccan Jewish Heritage, Berber History and Culture, Arab Spring, and Experiential Learning: Interning with Moroccan NGOs. I also instruct Muslim imams in wasatiyya (middle, or centered) Islam. My aim is to highlight the peaceful and humanist image of Islam and the convergence of its teaching with the teachings of other religions such as Judaism and Christianity, as well as other world faiths that propagate a message of peace, brotherhood, understanding, and well-being of humans. I also teach cross-cultural courses to Moroccan university students aspiring to further their education in the West. Interfaith service is two-tiered work: education first, and field service next. The educational aspect should hinge on comparative religion instruction in school, understanding the similarities between different faiths, interfaith summer camps, and exchanges between students of different faiths. The field service aspect, on the other hand, should include work with NGOs in the host country, especially in areas of development such as literacy, women’s empowerment, vocational education, etc., and engaging with locals in intercultural communication and interfaith exchange. I was born in the Berber mountains of northern Morocco, in a family that practiced Sufi Islam. All of my ancestors, my children, and I are Sufis. Through education and practice, I earned the title of Sufi master, which entitles me to teach Sufism and develop its theory in writing. I believe Sufism is the antidote to radical Islam. At the age of 12, my family moved to the city of Sefrou, a Berber town south of Fes, sitting on the lap of the Middle Atlas mountain range. Historically, this town was home to a large Jewish population that engaged in the trans-Saharan caravan trade. This small city is nicknamed “Small Jerusalem,” has attracted several American social scientists such as Clifford Geertz, and is known internationally for its interfaith coexistence. Our neighbor was a Jewish family that adopted us immediately upon arrival, and their son Moshe, who was my age, became my adoptive brother. Our families shared everything: food, clothes, knowledge, and most importantly, love and affection. This interfaith story lasted from 1963 until 1970, when the family came under pressure from the world Jewish hierarchy and left to Israel. I remember the day of their departure; we wept, hugged, kissed, and moaned for the terrible loss for both families. Moshe and I went to different primary schools, but the schools were very close to each other. One day, because of heavy rain, the roof of the Muslim school caved in. The school director of the Jewish school offered the school director of our institution the use of the Jewish school’s premises. So for six months, Moshe and I studied, played, and ate in the same school. This Jewish school of Sefrou is unfortunately abandoned today, but it still stands in defiance of ISIS’ hateful ideology. Sefrou was not only about the interfaith friendship of two innocent kids, but also about two religions that lived side by side in total harmony. Another good illustration of interfaith harmony in this city is a cave called kaf al-mumen (the cave of the faithful), located at the base of a small mountain outside of Sefrou. Both the Muslim and the Jewish communities believe that one of their saints is buried inside. The Muslims use the place for six months of the year, and the Jewish community uses it for the other half of the year. This is an excellent example of interfaith harmony, and Sefrou is, undoubtedly, the capital of interfaith coexistence in the Middle East/North Africa region. From 1987 to 2013, I worked at the Islamic Educational, Scientific and Cultural Organization (ISESCO, an agency of the Organization of Islamic Cooperation) as an expert and director in the following areas: education, culture, interfaith dialogue, intercultural dialogue, alliance of civilizations, and international cooperation. I trained people in Africa and Asia in devising curricula for imam training. I also helped universities set up comparative faith studies and trained teachers in this subject. I participated in several interfaith meetings in Europe attended by Muslims, Christians, and Jews over a period of 25 years. I also organized several meetings and activities with the United Nations Alliance of Civilizations, notably visits of Western journalists to Morocco and other Muslim countries. I have also helped many countries in Africa devise peace studies curricula to enhance peace between different religious communities in war-torn countries: in the Great Lakes region and in other sub-Saharan areas. Tertiary education plays a crucial role in shaping the political elite and decision-makers of tomorrow, so it is crucial that higher education institutions introduce the following themes in their curricula: interfaith understanding and respect, interfaith exchange, intercultural dialogue, and cross-cultural studies. These institutions should set up active academic research in these areas and encourage more students to complete exchange and semester abroad programs. What kind of support have you received—from your government, friends and family, institutions, organizations—in pursuing interfaith service-related work? I receive a lot of verbal encouragement in my academic work, but unfortunately, no funding. I write extensively and give interviews, and I have started getting invitations from some universities to do presentations and give lectures on interfaith and intercultural dialogue. The main challenges that I face in my work presently are lack of funding and lack of availability of institutions to set up interfaith and intercultural dialogue courses and trainings. I enjoy the fact that my work brings people together, puts smiles on their faces, and helps them realize that religions are not that different; it is men with evil agendas that draw a wedge between people. Religion is about the love of god and the love of the other. What is one thing you would like to see change in your community in terms of interreligious relations and understanding? I would like to see tolerance, empathy, forgiveness, and love take the place of unjustified hate and unacceptable calls for extremism, violence, and stubbornness. What are some best practices you have seen or heard of for interfaith work that you would like to share with others in your field? Some of the good practices that I have heard of are interfaith/intercultural high school and university exchanges, summer camps, development internships, and professor exchanges.